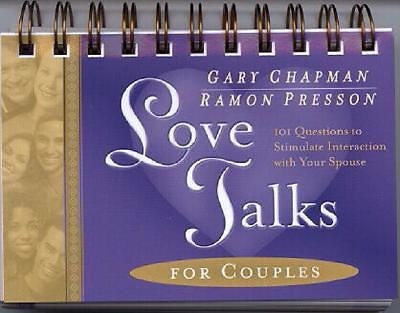 Bestselling author and marriage counselor Gary Chapman has developed this handy tabletop resource to get you and your spouse talking. With 101 probing questions, couples will find their relationship enhanced, their intimacy deepened, and their romance ignited. "101 Conversation Starters for Couples" is the perfect companion to the bestselling book, "The 5 Love Languages." It also makes an excellent Valentines Day, wedding, and anniversary gift. It helps you and your spouse get the conversation flowing.